Salads are one of my favorite things to eat and I’m not kidding when I say this. I was that odd kid who at 10 years would ask for a chicken salad at restaurants instead of chicken finger or a happy meal. In my 20’s things haven’t changed much, except of course that I’m always on a diet and watching my waistline lol. Nonetheless, I still enjoy eating salads. Now, there are a ton of different salads but a Cranberry Chicken Salad is perhaps my most go to salad because it has all the components that I think make a great salad. My Cranberry Chicken Salad has fresh greens-something sweet-something crunchy-and something slightly salty. 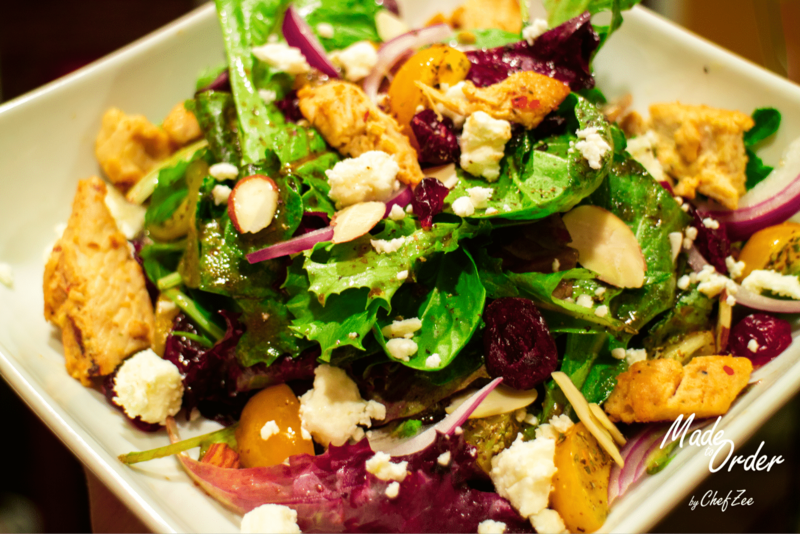 Great salads all have different flavors and textures that when combined create a tasty well balanced salad. 1. This is optional but start by adding your salad dressing to your salad bowl. I like to have my salad dressing at the bottom of the bowl because it makes mixing my salad so much easier later on. 3. Now add your washed and clean spring mix, thinly sliced onions, feta cheese, tomatoes, cranberries, sliced almonds, and chicken into the bowl. 4. Feel free to sprinkle some freshly cracked pepper to your salad. This will enhance all of the flavors. Please note that the cranberries and tomatoes may fall to the bottom of the bowl. Be sure to scoop out that goodness when serving! The foundation to all salads begins with fresh greens. The integrity of the ingredients you use in a salad matters! Trust me on this. How many times have you scoffed when you’ve gotten a salad that’s halfway out the door and wilted? Or even worse yet, kind of slimy because it’s already started to rot? … Exactly. Apologies if I grossed you out there. My point is, that you want to take the time and use fresh quality greens. For this salad in particular, I used a mix of baby spinach and a spring mix. However, feel free to use whatever you like. Arugula salad in particular, is another favorite of mine to substitute. The peppery arugulas contrasts quite nicely with the sweetness of the dried cranberries. The cranberries in this salad are slightly sweet and offsets any vinaigrette that you use to dress the salad or even arugula if you decide to the delicious peppery green. The pops of sweetness will have you adding craisins to all of your salads. Another sweet factor I used in this salad was the dressing. I dressed the salad with a Sweet Balsamic Vinaigrette because it brings all salad together as a whole. Balsamic vinegar is rich and when you add some brown sugar or honey, it thickens the vinegar making it slightly decadent. Funny enough, it’s the perfect added sweetness to the cranberries. The two work harmoniously together—they’re the perfect pair! Now depending on my mood, I’ll sometimes use a simple red wine vinaigrette or even a lemon vinaigrette with this salad. The dressing is much more tarte but the rewards from the cranberries are even greater! The sweetness in the cranberries beautifully contrasts the acidity in the vinegar. For most of my salads, I typically use sliced almonds because I always have them on hand. I snack on them, I bake with them, and they’re usually on sale. However, I also love using walnuts. Nonetheless, any nut will give your salad a surprise crunch. It also fills you up a little bit more. Give it try if you haven’t already. I have the hardest time eating salad without nuts. Lol… true story. Last but not least, our salad isn’t complete without something salty which comes in the form of cheese! I used feta in this salad because feta is simply life but feel free to use parmesan, gorgonzola, and goat cheese… whichever cheese you like. I particularly used feta cheese because it’s a semi bold cheese that pairs nicely with the craisins and balsamic vinaigrette. Let me know what you guys think! Buen provecho!